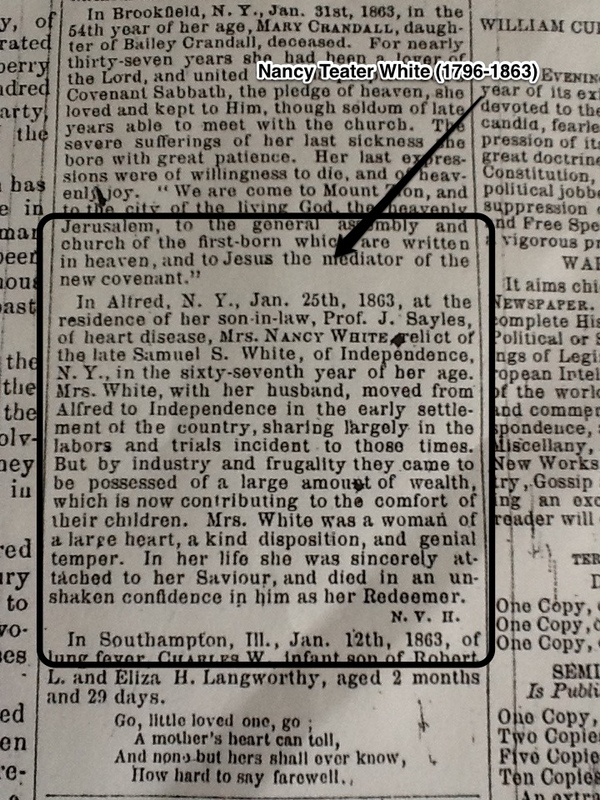 Nancy Teater White survived her husband, Samuel S. White, by two and a half years. This generous soul could well have spent her widow years with the sons who lived in Independence and neighboring Whitesville. But she died in Alfred, a nearby town and home to Alfred University. Her daughter, Serena White Sayles, lived on the campus of that college in the Gothic, a home built by Samuel in the early 1850s. At the time of Nancy’s death, Serena was home alone with nine month old baby Christopher, five year old Merlin, and eleven year old Clifton; and she may well have been on faculty of that college teaching French as she had periodically since 1848. Professor-now-Captain Ira Sayles was actually in a hospital tent outside Camp Suffolk, Virginia, suffering the effects of leading Company H, 130th Regiment of the New York State Volunteers in camp drills and exhausting training marches in the Black River area. Grandma White ended her life in Alfred at her daughter’s home, where she no doubt had helped Serena juggle the demands of young children, a baby and a community while her son-in-law served his country far from home. Or at least tried to help before becoming another dependent in the Gothic household. I like to think that Serena clung to a community of strong women that January, as her mother passed on. I am certain that she missed the genial spirit of Nancy Teater White, as the next month’s uncertainties unfolded.